Frances Milton Trollope, also known as Fanny Trollope (10 March 1779 – 6 October 1863), was an English novelist and writer who published as Mrs. Trollope or Mrs. Frances Trollope. Her first book, Domestic Manners of the Americans (1832) has been the best known. She also published social novels: one against slavery said to have influenced Harriet Beecher Stowe, the first industrial novel, and two anti-Catholic novels that used a Protestant position to examine self-making. Some recent scholars note how modernist critics exclude women writers such as Frances Trollope from serious consideration. In 1839, The New Monthly Magazine claimed, "No other author of the present day has been at once so read, so much admired, and so much abused". Two of her sons, Thomas Adolphus and Anthony, became writers. 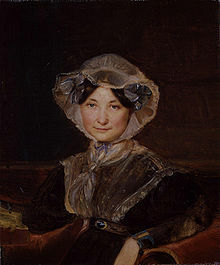 Her daughter-in-law Frances Eleanor Trollope (née Ternan), second wife of Thomas Adolphus Trollope, was also a novelist. Born at Stapleton, Bristol, Frances was the third daughter/middle child of the Reverend William Milton and Mary, née Gresley. Frances's mother passed away in childbirth when Frances was five years old. Her father remarried to Sarah Partington of Clifton in 1800. She was baptised at St Michaels, Bristol, Gloucester, England on 17 March, 1779. As a child, Frances read a great amount of English, French, and Italian literature. She and her sister later moved to Bloomsbury, London in 1803 because her brother, Henry Milton, who was employed in the War Office. In London, she met Thomas Anthony Trollope, a barrister, and at the age of 30, married him on 23 May 1809 in Heckfield, Hampshire. They had four sons and three daughters. in this consecutive order: Thomas Adolphus, Henry, Arthur, Emily (who passed away in a day), Anthony, Cecilia and Emily  The Trollopes then faced financial struggles for lack of agricultural expertise when they moved to Harrow-on-the-Hill in 1817, a leased farm. This was also where Frances gave birth to her last two children  Two of her sons also became writers: her eldest surviving son, Thomas Adolphus Trollope, wrote mostly histories: The Girlhood of Catherine de Medici, History of Florence, What I Remember, Life of Pius IX, and some novels. Her fourth son Anthony Trollope became the better known and received novelist, establishing a strong reputation, especially for his serial novels, such as those set in the fictional county of Barsetshire, and his political series the Palliser novels. Despite producing six living children, their marriage was reputedly unhappy. Soon after the move to the leased farm, her marital and financial strains led Frances to seek companionship and aid from Fanny Wright, ward of French hero General Lafayette. In 1824 she visited La Grange, Lafayette's estate in France. Over the next three years, she made several other visits to France and was inspired to take an American excursion with Wright. Frances thought of America as a simple economical venture and figured that she could save money by sending her children through Wright's communal school as Wright had planned to reform the education of African American children and the formerly enslaved on their property in Tennessee. In 1827, Frances Trollope took most of her family to Fanny Wright's utopian community, Nashoba Commune, in the United States. Her husband and remaining family followed shortly after. Because she arrived in the US four years earlier than her husband, she was able to develop an intimate relationship with Auguste Hervieu, a collaborator in her venture, and moved to Cincinnati, Ohio with her sons after the community failed. She also encouraged the sculptor Hiram Powers to do Dante Alighieri's Commedia in waxworks. Nonetheless, although she tried to find ways to support herself in America, they were all unsuccessful. She found the cultural climate uninteresting and came to resent democracy. Furthermore, after her venture failed, her family was more in debt than when she had migrated there – forcing her and her family to migrate back to England in 1831. From her return at the age of 50 until her death, she began writing novels, memoirs of her travels and other shorter pieces, while traveling around Europe, to make an income for her family and escape debtors. She became well acquainted with elites and figures of Victorian literature including: Elizabeth Barrett, Robert Browning, Charles Dickens, Joseph Henry Green and R. W. Thackeray (a relative of William Makepeace Thackeray). She wrote 40 books: six travelogues, 35 novels, countless controversial articles, and poems. In 1843, Frances visited Italy and eventually moved to Florence permanently. On her return to England, Trollope began writing and gained notice with her first book, Domestic Manners of the Americans (1832). She gave an unfavourable, and in the opinions of partisans of America, exaggerated account of the subject. Her novel, The Refugee in America (1832), expressed similar views, prompting Catherine Maria Sedgwick to respond that "Mrs. Trollope, though she has told some disagreeable truths, has for the most part caricatured till the resemblance is lost." She was thought to reflect the disparaging views of American society allegedly commonplace at that time among English people of the higher social classes. Later on, Trollope wrote further travel works, such as Belgium and Western Germany in 1833 (1834), Paris and the Parisians in 1835 (1836), and Vienna and the Austrians (1838). Among those with whom she became acquainted in Brussels was the future novelist Anna Harriett Drury. Next came The Abbess (1833), an anti-Catholic novel, as was Father Eustace (1847). While both novels borrowed from Victorian Gothic conventions, the scholar Susan Griffin notes that Trollope wrote a Protestant critique of Catholicism that also expressed "a gendered set of possibilities for self-making" which has been little recognised by scholars. She noted that "Modernism's lingering legacy in criticism meant overlooking a woman's nineteenth century studies of religious controversy." Trollope received more attention during her lifetime for what are considered several strong novels of social protest: Jonathan Jefferson Whitlaw (1836) was the first anti-slavery novel, influencing the American Harriet Beecher Stowe's Uncle Tom's Cabin (1852).. It focuses on two powerful families – one that strongly that encourages slavery and another that strongly opposes it and provides sanctuary for slave refugees. It antagonizes pro-slavery characters, making them appear foolish and uncultured. Frances also incorporates her idea of a stereotypical American by drawing certain characters as shrewd, convincing, sly and greedy. Published in 1840, Michael Armstrong: Factory Boy was the first industrial novel to be published in Britain, inspired by Frances's visit to Manchester in 1832, where she examined the conditions of children employed in the textile mills. The story of a factory boy who is rescued by a wealthy benefactor at first but later returns to the mills, it illustrates the misery of factory life and suggests that private philanthropy alone will not solve the widespread misery of factory employment. Other socially conscious novels included The Vicar of Wrexhill (1837 / Richard Bentley, London, 3 volumes), which took on the issue of corruption in the Church of England and evangelical circles. Possibly her greatest work is the Widow Barnaby trilogy (1839–1855), which includes the first ever sequel. In particular, Michael Sadleir considers the skilful set-up of Petticoat Government , with its cathedral city, clerical psychology and domineering female, as something of a formative influence on her son's elaborate local set up and colorful cast of characters in Barchester Towers, notably Mrs Proudie. In later years Frances Trollope continued to write novels and books on miscellaneous subjects – in all over 100 volumes. In her own time, Trollope was considered to have acute powers of observation and a sharp and caustic wit, but her prolific production coupled with the rise of modernist criticism caused her works to be overlooked in the 20th century. Few of her books are now read, but her first and two others are available on Project Gutenberg. After the death of her husband and daughter, in 1835 and 1838 respectively, Trollope relocated to Florence, Italy, having lived briefly at Carleton, Eden in Cumbria, but finding that (in her son Tom's words) "the sun yoked his horses too far from Penrith town." One year, she invited Theodosia Garrow to be her house guest. Garrow married her son, Thomas Adolphus, and the three lived together until Trollope's death in 1863. She was buried near four other members of the Trollope household in the English Cemetery of Florence. ^ Nicola Diane Thompson, Victorian Women Writers and the Woman Question, Cambridge University Press, 2012. ^ Neville-Sington, Pamela. "Trollope [née Milton], Frances [Fanny] (1779–1863), travel writer and novelist | Oxford Dictionary of National Biography". www.oxforddnb.com. Oxford University Press. doi:10.1093/ref:odnb/9780198614128.001.0001/odnb-9780198614128-e-27751. Retrieved 19 February 2019. ^ "Ancestry Library Edition". ancestrylibrary.proquest.com. Retrieved 19 February 2019. ^ Quoted in M. Sadleir, Trollope: a commentary (London, 1945) p. 101. ^ The Cambridge Bibliography of English Literature, Volume 4; Volumes 1800–1900, Cambridge University Press, 2000. ^ a b "Michael Armstrong: Factory Boy". Spartacus-Educational.com. Archived from the original on 27 January 2012. Retrieved 26 February 2019. ^ Lefkowitz, R. J. (15 September 1975). "LibriVox". librivox.org. Retrieved 19 February 2019. ^ "Literary Encyclopedia | The Widow Married; A Sequel to the Widow Barnaby". www.litencyc.com. Retrieved 21 August 2017. ^ Quoted in G. Lindop, A Literary Guide to the Lake District (London 1993) p. 135. ^ Trollope, Frances Milton (1857). Lynch Law; or, the Life and Adventures of Jonathan Jefferson Whitlaw ... New edition. Ward and Lock. Chisholm, Hugh, ed. (1911). "Trollope, Anthony" . Encyclopædia Britannica (11th ed.). Cambridge University Press. This article on her son has a short biography of her. Brenda Ayres (2002). Frances Trollope and the Novel of Social Change. Greenwood P. ISBN 0-313-31755-0. Teresa Ransom (1995). Fanny Trollope. Alan Sutton Publishing Limited. ISBN 0-7509-1269-3. Edmund White (2003). Fanny: A Fiction. Hamilton. ISBN 0-06-000484-3. Wikisource has the text of the 1885–1900 Dictionary of National Biography's article about Trollope, Frances. This page was last edited on 22 April 2019, at 14:51 (UTC).